When highways and other barriers that impede pedestrians are taken into account, the actual walkshed for the Broadway station is much smaller than the area produced by "as the crow flies" calculations. 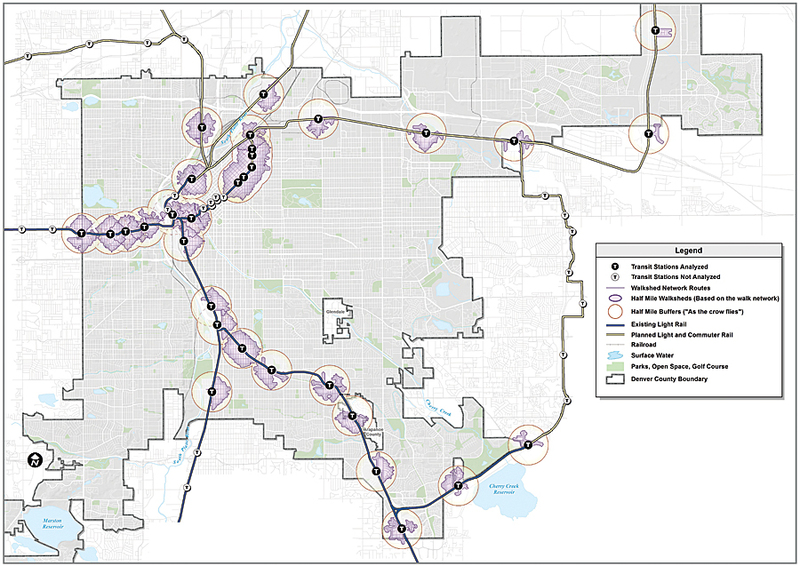 By analyzing network-data-based routes where people can actually walk, Denver’s Community Planning and Development (CPD) Department GIS staff provided planners with better information to design communities that promote the use of public transportation. As the population of the Denver Metropolitan Area continues to grow, improving transportation infrastructure and mobility options becomes key to the region’s success. Commitment to transit has been demonstrated through the Regional Transportation District’s FasTracks program, which has more than a hundred miles of new commuter rail and light-rail planned, under construction, and completed. As this expanded system is being constructed and stations are established, Transit Oriented Development (TOD) has become a high priority for the City and County of Denver. Denver’s CPD has taken a lead by maintaining a TOD Strategic Plan and adopting numerous small area plans specific to individual stations. TOD is a mixed-use residential and commercial development designed to maximize access to public transportation. With this approach, the development of the area around a transit station is focused on that station. Ideally, the area contains high-density development and a mix of land uses. People can live, work, and move around the area without being dependent on automobiles. A TOD area should provide a high-quality pedestrian experience with intuitive connections. The station area should be walkable and sustainable. In creating the station walkshed, it is assumed that the distance people will walk to get to a transit station is about a half mile for light-rail and commuter rail and a quarter mile for buses. In the past, CPD has mapped TOD walksheds “as the crow flies.” An area mapped using this approach may contain places that are not necessarily accessible to pedestrians. For the 2014 Strategic Plan Update, planners wanted to produce more accurate representations of the transit station area walksheds. To accomplish this, CPD GIS staff used the ArcGIS Network Analyst extension to map a half-mile distance against a walk network that incorporated off-street trails and pedestrian bridges and took into account barriers such as highways, rivers, and railroads. Realistically mapping half-mile walksheds, taking into account pedestrian barriers, lets planners better assess connectivity and the value of potential infrastructure improvements. Mapping walksheds began with preparation of the walk network that the analysis would be run against. The street network was modified to exclude highways and highway ramps where people do not walk. Pedestrian bridges and off-street trails were added as well as planned connections and network intersections. The dataset was then populated with attributes for distance, walk speeds, and time traveled to allow the software to map all possible half-mile routes traveling away from each station in any direction. Once all possible walk routes were identified, the software created a polygon connecting the half-mile routes and generating the walkshed or accessible walkable area. One of the main challenges facing CPD is that much of the transit system was planned or developed fairly recently, long after the city was established. Available land is limited by existing development and property ownership. New tracks are being built along interstate highway rights-of-way and freight railroads, which results in many barriers that compromise pedestrian station access. Mapping the half-mile walksheds gives planners a way to better assess connectivity and evaluate where potential infrastructure improvements would be most beneficial. It is no surprise that the most complete walksheds are located in traditional urban street grids that have few disruptions or those areas with strategically located pedestrian connections. Grids and areas with well-planned connections maximize the service area and generate the highest potential ridership. Comparing walksheds to the as the crow flies buffers reveals a loss from previously assumed potential ridership and service areas. For example, an analysis of Louisiana-Pearl Station area, one of the most complete networks, identified 160 acres and 633 living units that are not actually accessible within the walkshed but are shown within the original half-mile buffer. Across the board, a half-mile buffer yields a 502-acre station area, while the average walkshed size for stations analyzed is only 198 acres. 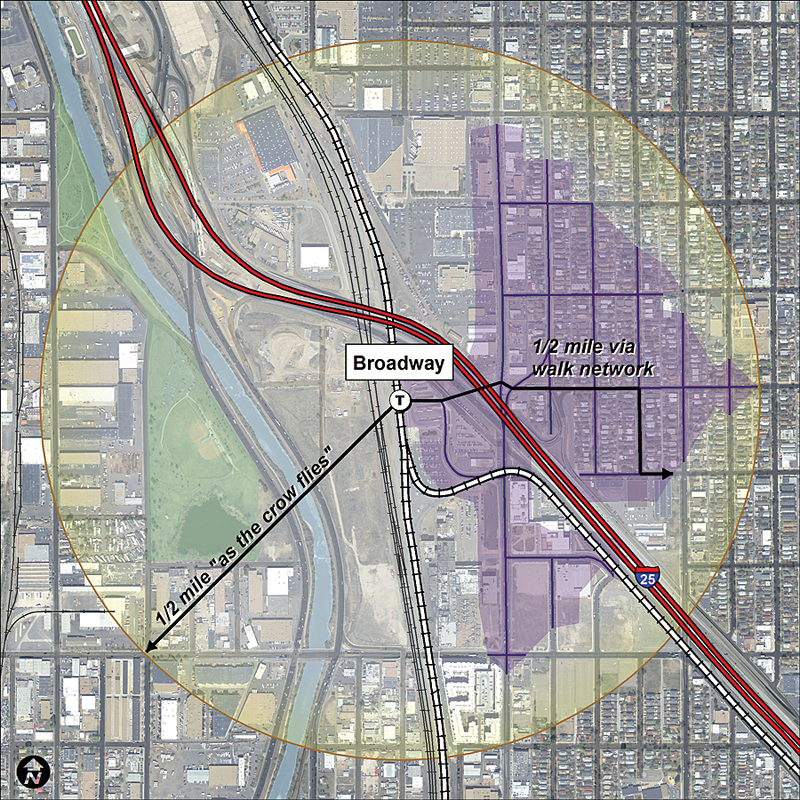 Since Denver city planners have more accurately mapped the TOD station areas, they have been able to refine station area research and analysis. Once mapped, the walksheds were utilized to collect TOD-related data to evaluate market readiness and group stations according to varying levels of development potential. Now, a more realistic and efficient approach can be applied to stations with the greatest opportunity for near-term development and TOD implementation. All these efforts not only promote the successful development of each transit station but also ultimately help manage increased population growth, maximize mobility, and create vibrant and desirable transit communities. To learn more about the TOD Strategic Plan, visit www.DenverGov.org/TOD. For more information, contact Andrea Santoro, GIS analyst, or Steven Chester, city planner.